Any parent who puts this on their child in order to make him or her study should be chemically castrated with the harshest drugs possible. If they must rely on something like the Study Ball (shown at right) then they haven't a damn clue about what it means to be responsible parents at all! The Study Ball is based on the old-fashioned "ball and chain" that prisoners were made to wear so as to inhibit any escape attempts. In the case of Study Ball though, it's meant to keep a child anchored in one place for a predetermined span of time: purportedly studying for exams instead of watching television, etc. 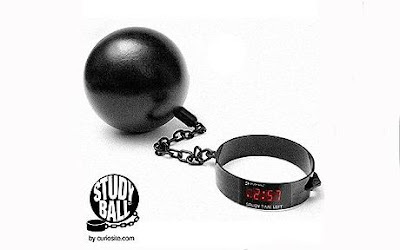 Parents fasten the 21-pound Study Ball to a kid's ankle and then a digital timer counts down the "study time left", automatically locking when time expires. It can't be made to stay locked for more than four hours and it comes with a key that allows removal at any time. What's next: turning entire kindergarten classes into chain gangs?